Come Saturday and its time to go to our studio apartment on the beach. I don’t want to spend time cooking in the studio so I prepare beforehand dinner for Saturday and Sunday. Hubby and I love to spend the evening chatting, watching telly or sitting on the beach. Usually we need something to munch on. For last Saturday I was going to take some crackers but they are pretty boring…. tasteless. So I thought of making a dip to go along with it. Many ideas cropped up but then the choice was limited to the ingredients I had at home. I had a medium size eggplant and that’s all. I remember tasting an eggplant dip with pita bread at a restaurant Rumi in Montreal. Loved the dip and so decided to make some. It was very easy to make and had a good balance of all the flavours. Hubby dear has requested that I make some more for the following weekend as he finished it all. This dip will go well with crackers, nachos, pita bread, crisps, bread sticks, whatever you want to serve. I’ve got guests on Friday for dinner and am planning to serve the dip with some crunchy tiny pieces of toast. Here’s the recipe for you to try out. Peel and chop the onion into chunks. Wash the eggplant. Remove the stem and cut it into thick slices or chunks. Put the eggplant, onion and garlic in the baking tray. Drizzle about 1 tbsp olive oil over the vegetable and roast for 20 to 25 minutes or till the eggplants are done. Put the roasted vegetable into a food processor. Add the remaining ingredients and process into a coarse puree. Serve immediately or store in the fridge till required. Add fresh basil instead of coriander. Add more olive oil if you like. Store the remaining dip in the fridge. Looks so delicious! Thanks for sharing it in Favorite Recipes event. 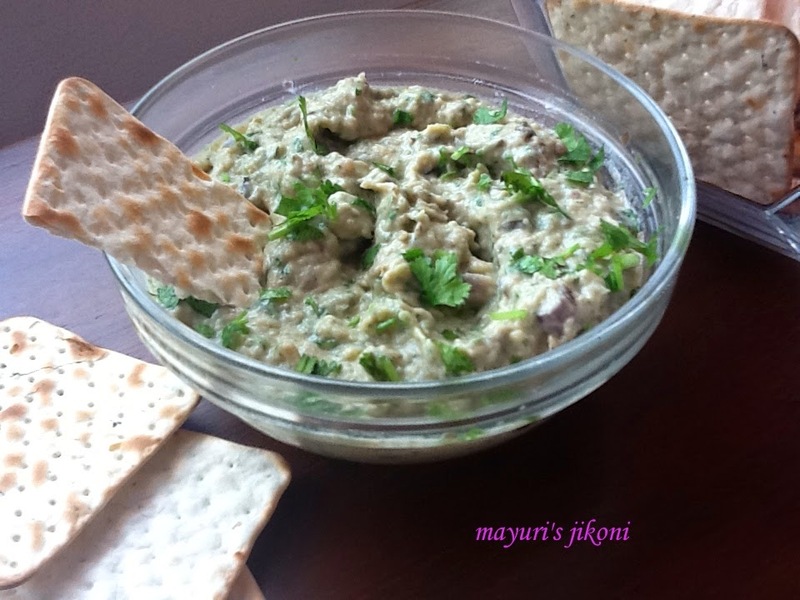 Eggplant dip is my weakness, this roasted eggplant dip looks absolutely stunning. Thanks for linking it to The Veg Bix event!